With a premise ripped straight from the headlines, 2 year old Samantha Shipley goes missing from her hotel room one night while her parents are dining in a restaurant down below. Whether a coincidence or intentional, the premise of She's Not There by Joy Fielding was so very reminiscent of the real world disappearance of Madeline McCann, that I was instantly hooked. Fifteen years later, Samantha's mother Caroline is struggling to cope while the press continue to hound them and the pressure of the disappearance has torn their family to shreds. Out of the blue, Caroline receives a call from a girl who believes she might be Samantha. She's Not There was an absolutely gripping psychological thriller and I enjoyed getting to the truth of who Samantha was. The family dynamics seemed genuine and Caroline was a likeable character. I especially enjoyed the real-life inspiration for Caroline's mother and the mention of her in the author's acknowledgements: "...without mentioning my very own long-deceased grandmother Mary, my father's mother and as miserable a woman as ever walked this earth. She was the inspiration for Grandma Mary, and while this novel is unquestionably a work of fiction, many of the quotes attributed to her came straight from her mouth." Wow! This made me love the book even more. As well as being chock full of suspense, this is also a mystery/whodunnit, so it will appeal to a wide range of readers. The only reservation I have is the cover; I didn't see the relevance to the story at all. 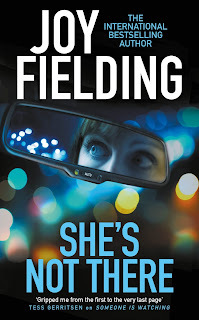 She's Not There was my first time reading Joy Fielding so what a thrill to discover she has a huge back catalogue. I'll admit I did allow myself at times to believe this could be the story of Madeline McCann, and perhaps there's nothing wrong with that. Highly recommended.